This is a quite casual fall outfit, perfect for the days where you want to look stylish effortlessly, and as usual with anyone outfit idea, you can create other amazing outfits by just changing a piece or two. So the first piece is a simple clean white tee, one of the most perfect pieces for layering, then I added this cool bomber jacket from Zara, to keep you warm if there is a cold breeze outside, and it is not too thick so it won’t let you sweat either, also you obviously need a pair of pants, you can go with almost anything in this combo, you can wear joggers, sweatpants, chino or jeans, therefore I went my distressed pair of jeans from Pull&Bear just to give the outfit a more rugged and stylish look, afterwards, I finished the whole outfit with a pair of suede sneakers fromPull&Bear, but again you can go with almost any fashion sneaker or runner you like. For accessories I added two accessories which I think are essential for any casual outfit, which are the watch and a few bracelets, after that, I added a leather necklace just to give the outfit that extra bling and make it look more stylish. 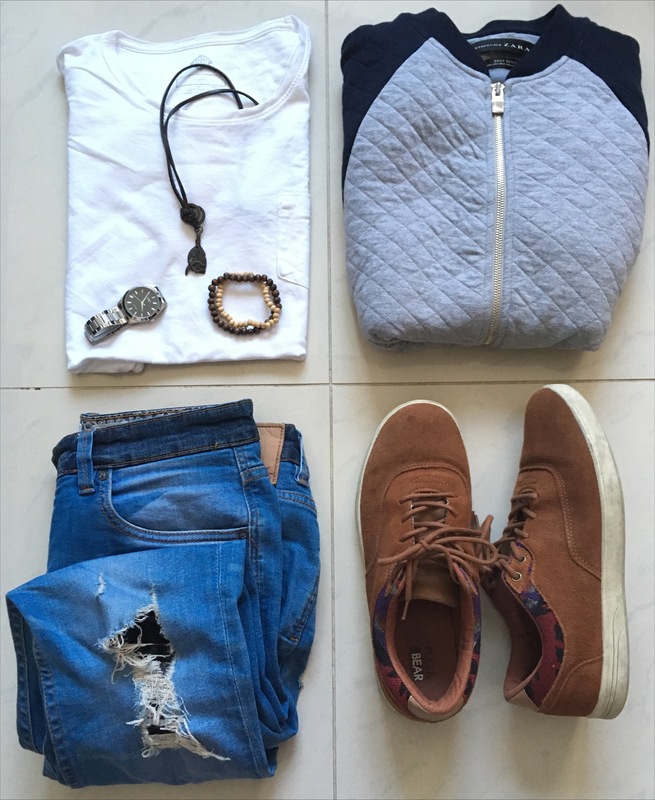 This outfit is fit for any casual event gentlemen, it is great to wear when you have a coffee date, or just going for a walk, because it will make you look effortlessly stylish, and as always remember fit is king when it comes to men’s style. Qotd: What is your favourite piece of the outfit? The jacket is my favorite part! hi! i like your style, but i’m thinking it’s cool have the same color from shirt – to shoes.